This tri-tip roast is marinated in a savory sauce and then grilled. You want to sear the roast at first, then lower the heat and continue grilling until done. In a blender combine garlic, parsley, cilantro and basil. Blend until fine. Add olive oil, rice wine vinegar, Tabasco, salt, and pepper. Blend until smooth. Pour half the mixture into a resealable bag and add tri-tip. Turn the tri-tip to coat and refrigerate for about 4 hours. Place the remaining half of the sauce in a container and refrigerate until you need it. Remove tri-tip from bag and place on hot grill. Turn the tri-tip after 2 minutes and grill for 2 more minutes. Turn down the heat or move to a cooler part of the grill. Grill for another 4 minutes per side then continue grilling over indirect heat. Continue cooking until done, about 15 more minutes. When done, remove the tri-tip from the grill and allow to rest for 5 minutes. Meanwhile, heat the remaining sauce until just warm. 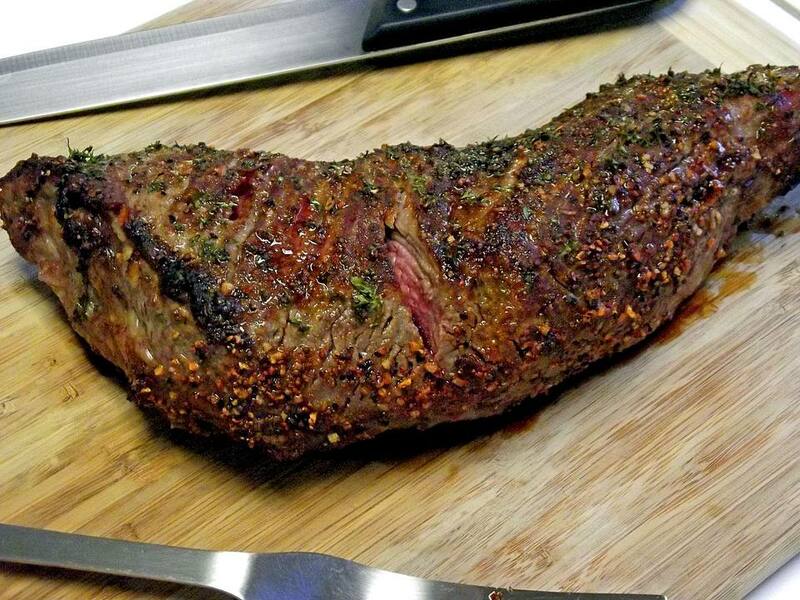 Cut tri-tip into thin strips and serve with sauce over the top.